Every year bobolinks, like this male, fly from the grasslands of Argentina to a hayfield in Westborough for the breeding season. Migrating bobolinks routinely make the longest round trip of any North American songbird. Where nature is concerned, we’re often surprised by the special things we find in our own back yards, or in our own town. One real treat is the sight of bobolinks. These grassland birds migrate all the way from South America to breed in Westborough and other places in the northern U.S. If you catch sight of a male bobolink (Dolichonyx oryzivorus) at this time of year, you’re not likely to forget it. Male bobolinks are decked out for the breeding season in black, white, and gold. Some folks think bobolinks look like they’re wearing a tuxedo backwards. They’re black in front – on the head and belly – with white patches on the back, and gold on the back of the head and nape of the neck. This color scheme makes male bobolinks stand out during the breeding season. Their colors get the attention of females and rival males. Their color pattern is the reverse of what we see on many birds, which are usually light underneath and dark on top. The usual pattern helps birds to blend into the light sky when you look up at them flying overhead, and to blend into the darker surroundings on the ground when you view them from above or from the side. Females and young bobolinks are patterned and colored to blend into their surroundings. They look much like large sparrows – brown and streaked. After the breeding season, male bobolinks lose their fancy feathers and look like this, too. To see bobolinks, you need to find a large, mature hayfield. This is where they breed. Bobolinks are social birds, and they breed in colonies, so you’re likely to find many bobolinks in a field. They nest on the ground, concealed among the grasses and leafy weeds of the hayfield. The hayfield needs to be large enough for a colony. It also needs to be mowed yearly, but it can’t be recently plowed or reseeded. And it’s especially important for the mowing to take place late enough in the season to allow the bobolinks (and meadow larks and other grassland birds) to finish nesting and raising their young. In Westborough, St. Luke’s field is one such hayfield (next to St. Luke’s cemetery). The community gardens are at one end, and the Heirloom Harvest CSA crop fields are at the other end. Bobolinks nest in the field between these cultivated areas. For the past seven years, farmer John Mitchell, who runs the CSA farm, has managed the field for St. Luke’s in a way that benefits the breeding birds. That means mowing the hay only once (instead of three times), and waiting until August to do it. The field is open to the public, but walkers must stay on paths and farm roads to avoid disturbing the birds. If you hear a male bobolink singing, that too is something you’re unlikely to forget. The song is bubbly and oddly metallic. To the human ear, it has a strange loveliness. Males sing as they glide over the hayfield, which they’ll do as part of claiming territory and also as part of courting females. They also sing as they perch in their territories, perhaps on top of a tall weed stem. A complex, musical song is typical of many birds that live in open country, where winds and variation in temperature can distort simpler songs with fewer, longer-lasting tones. Male bobolinks usually sing two main songs, but they also string portions of both songs together. Bobolinks from one area often sing in their own local dialect, and males that sing in the local dialect tend to be more successful in winning mates than other males are. When it comes to mates, male bobolinks often have two or sometimes even more. Females choose males with territories that include good feeding areas and nesting sites. Females also prefer males whose gliding flights and songs reveal them to be in good condition. Here’s how it works, more or less. Male bobolinks usually arrive at their breeding grounds – such as St. Luke’s field in May – about a week before females do. The males set about flying over portions of the field to claim territory. When the females arrive, the males glide and sing to show off for them. Once all the males in the field have paired up, they start pairing up with second females. Sometimes there might be a third female, or occasionally a fourth. The female bobolink builds the nest and lays the eggs, but the male shares the work of keeping newly hatched chicks warm, and of feeding the chicks both while they’re in the nest and for some time after they leave it. When a male has more than one mate, he helps the first one the most, but may also help feed the chicks in the second nest. 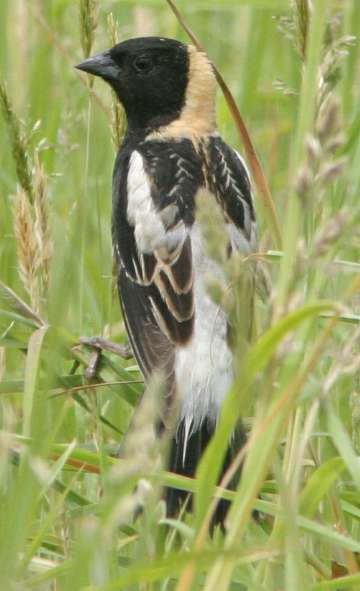 Bobolinks are well known for returning to the same breeding area year after year. The bobolinks of St. Luke’s field are most likely the same ones that came last year, and the same ones we’ll see there next year. Perhaps the most amazing thing about bobolinks is how far they come in order to breed here. Bobolinks are real long-distance travelers. In their yearly migrations they make a 12,500-mile round trip, between northern states in the U.S. and the grasslands of Argentina, or parts of Brazil, Paraguay, or Bolivia. This round trip is the longest of any North American songbird. Some shorebirds, such as the famed red knot (Calidris canutus), make longer trips, but they’re different from songbirds. Bobolinks breed here in the spring and summer, and then they cross the equator to catch spring and summer again in southern South America. How do they find their way? Researchers have found that bobolinks rely on the earth’s magnetic field for the information they need to find their way. Pigments in bobolinks’ eyes help the birds sense the magnetic field in a way that tells them the direction of the nearest pole and of the equator. Bobolinks also have magnetite, or iron oxide, in the cells of a nerve to the eye, and this substance helps them use variations in the earth’s magnetic field to make a kind of mental map. These direction-finding and mapping abilities are still under study. Like many other grassland birds, bobolinks are becoming less common in Massachusetts. One major reason is the decline of agriculture. The hayfields they need for breeding have been disappearing for decades. We can consider ourselves pretty lucky to have bobolinks in Westborough.